Those are all very neat and I really like the Hedorah. It features a strange but attractive array of colors. 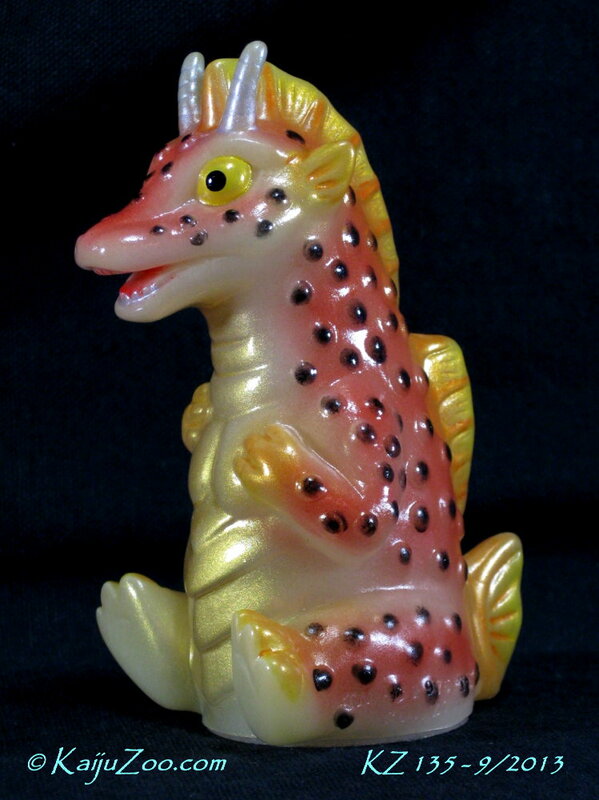 Ghido-Goji wrote: Those are all very neat and I really like the Hedorah. It features a strange but attractive array of colors. Thx, Chris! 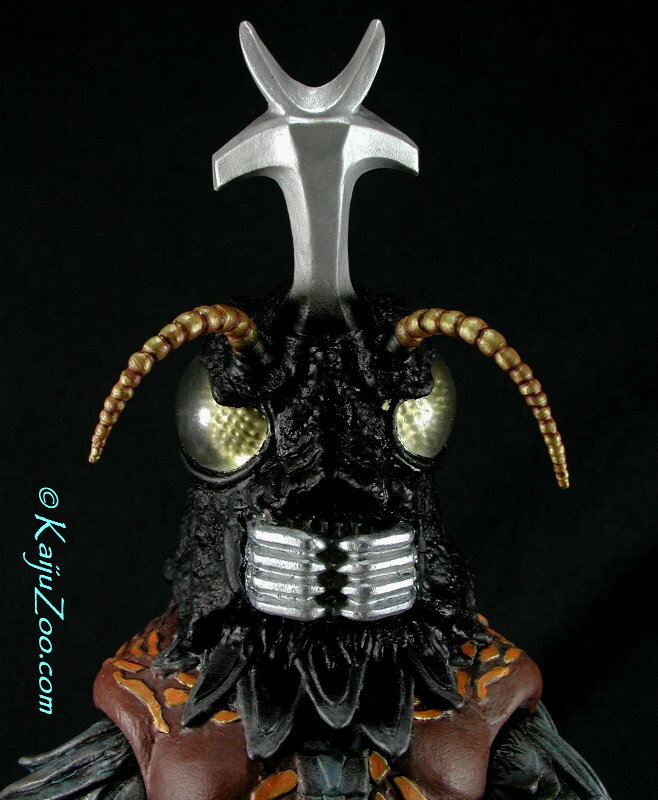 Yes, that KaijuZoo Y-MSF Hedorah was to pay homage to the Bullmark Hawaii Hedorah paint scheme. 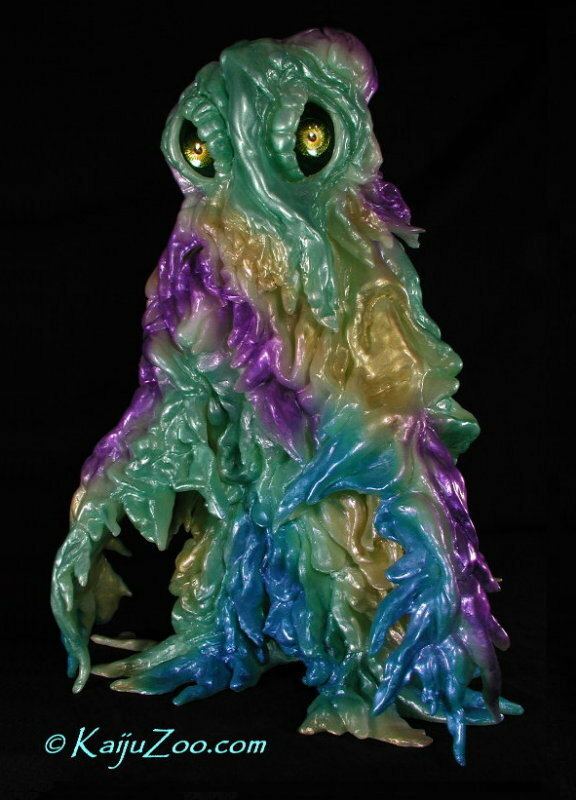 And speaking of "strange but attractive array of colors", this is a recent project of another KaijuZoo Hedorah, this time the glowie from Atelier G-1. It is huge, stands about 12 inches. Paints are thin translucent metallics which still allows the glow effect to stand out and then also oversprayed with five different color-shifting paints, quite remarkable when viewed in person. (p.s. I am still working to get the full webpages completed for this commission and for the aforementioned AFFE Gamera). John, that looks amazing!!!!!!!!!!!!!! I love the contrast! Totally amazing!!!!!!!!!!!!!!!!!!!!!! 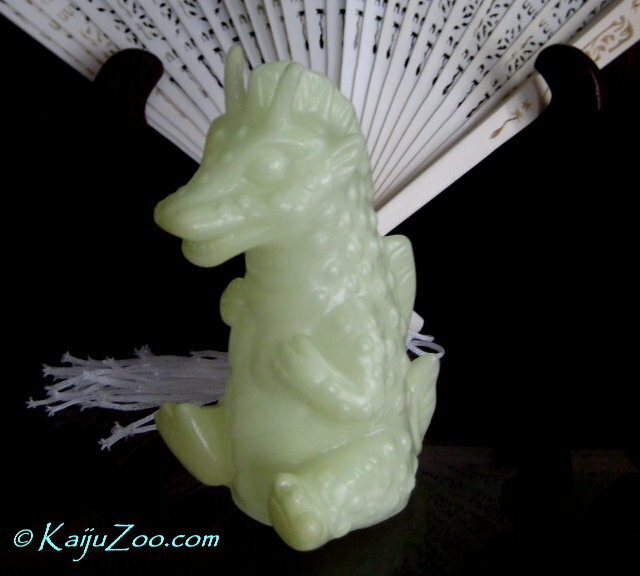 Any one hear from kaijuzoo? I have been trying to contact him to no avail. I see he hasn't posted in a while. 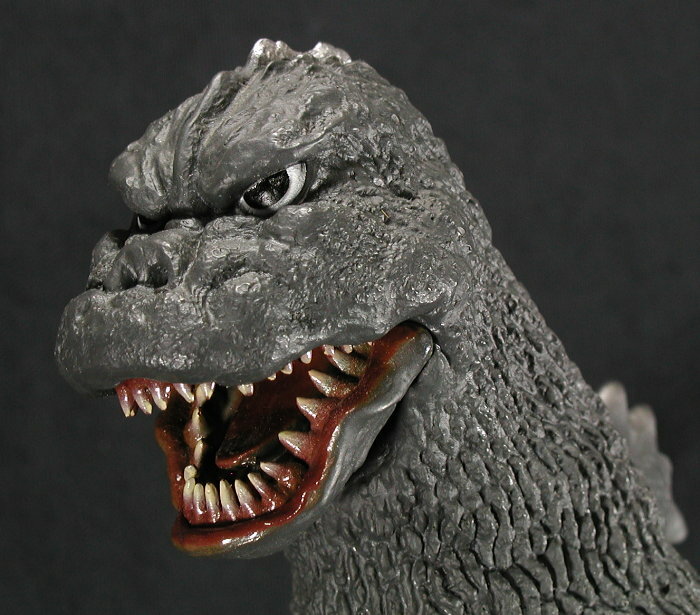 brianfett wrote: Any one hear from kaijuzoo? I have been trying to contact him to no avail. I'm still here and found your email hiding in my inbox, will respond later today. So, in cleaning out my brother's collection a month or two back, we came across a Billiken Godzilla 1975 model that was a wreck. 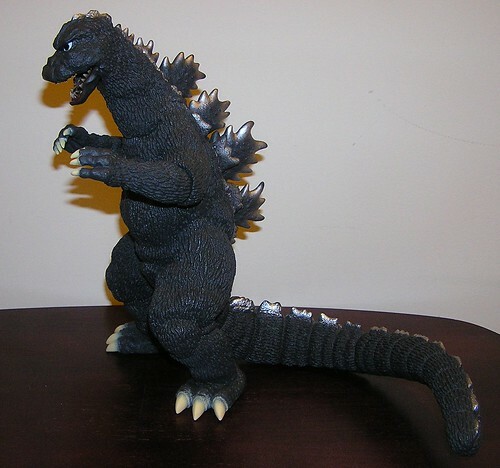 My brother had bought it built up already a few years back since it is his favorite Godzilla suit. The fins had now popped off, the head was off and he had tried more than once to fix it which really only added tons of glue but did nothing to fix it. He very reluctantly decided to just throw it away. Well, I fished it out later and brought it home with the intention of fixing it for him but soon realized that it was beyond my capabilities. Enter John at the Kaiju Zoo. He did a special rush job on it since my brother's birthday is this Saturday and I am sure you will agree that he did an awesome job with it. I can't thank you enough for this John, I can't wait to see his surprise and I am sure he will love it. His mouth looks like it's been stained with chocolate, LOL, but that is awesome work, especially for a rush job! Imagine if he took his time! Pedoleon wrote: His mouth looks like it's been stained with chocolate, LOL, but that is awesome work, especially for a rush job! Imagine if he took his time! Although stated tongue in cheek, "Rush job" actually refers to sliding this project into my work queue and not the amount of time spent on it. And here's what I had to work on to start with, most time spent recarving the neck joint for a nice clean glue line. Howze, many thanks for posting your pics and glad that you like it. I am quite sure that your brother will enjoy his surprise as well !! Some great pics John. To add to what John said, I did not mean at all that he rushed to get it done or didn't spend the time to do it right. He usually has a few commissions going at once and, as he said, he slotted it in to get it done in time. I gave the Billiken to my brother today and he was completly surprised. He thought I found a different one and had it built for him, he didn't realize that it was the same one he had. He totally loved it and has a space already picked out for it. As I have said before (and will probably say again), if you ever need anyhting done to customize or build your kits/models, John is the one to call on. Not only is he exceptionally skilled but a great person to deal with. It is totally evident that he not just makes money off of this but is a true fan and loves what he does. Thanks again John. I think it looks amazing! If I ever get that Billiken, I hope ya don't mind if I send it to ya, John! 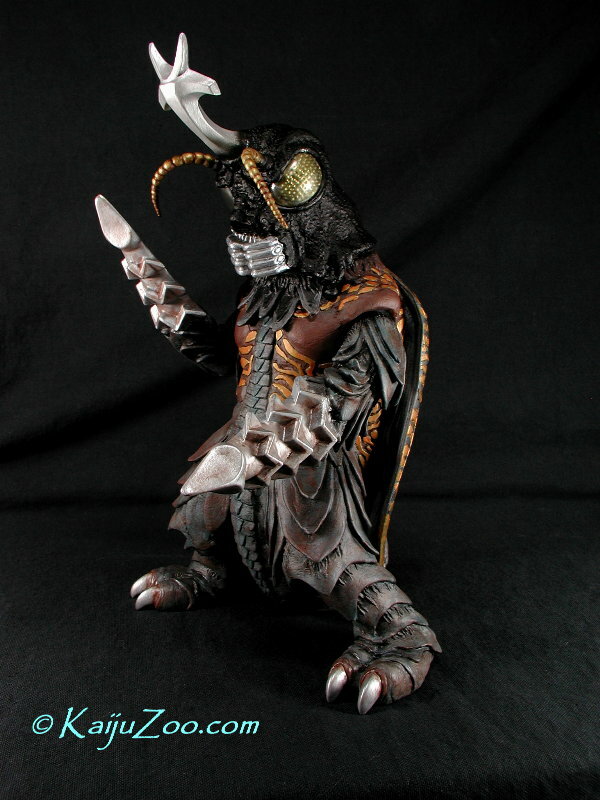 Wow Kaijuzoo, stunning work like always. I really need to use your services one of these days! That is some amazing work! 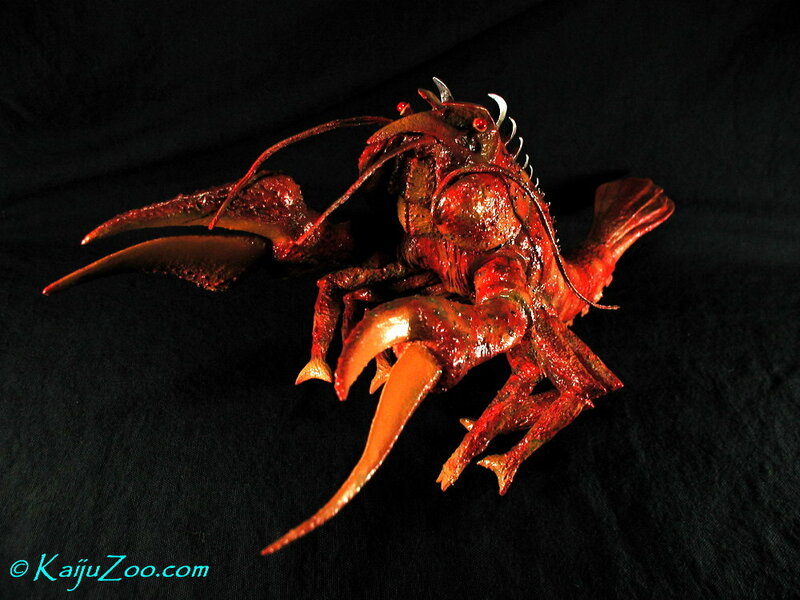 If and when I ever come into some steady disposable income, I may very well start looking in KaijuZoo's direction. John is most definitely the man...and I'm happy to say that I'm the proud owner of that Hedorah at the top of this page. And while John hasn't updated his website in a while, I've gone ahead and taken some shots of this bad boy...including glow shots! 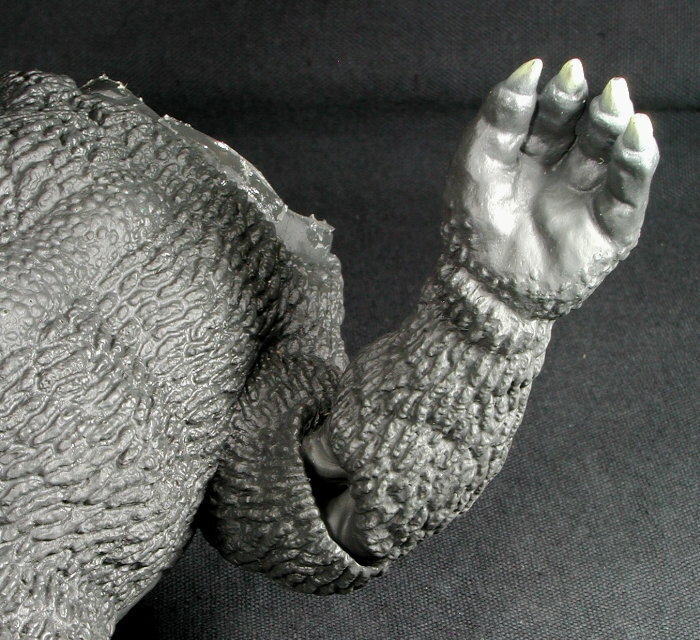 Been real busy the past few months wrapping up my 11th series of KaijuZoo Exclusive figures, this time using the super-detailed Marmit Megalon kit. 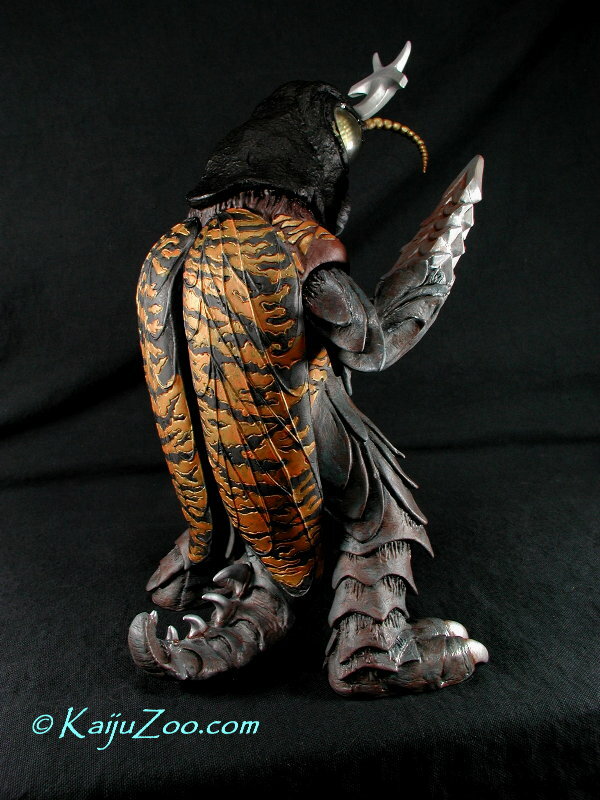 Because of the intricate details on the back and the four colors used on the body, this series was largely hand-painted with airbrushing used only for the basecoats. 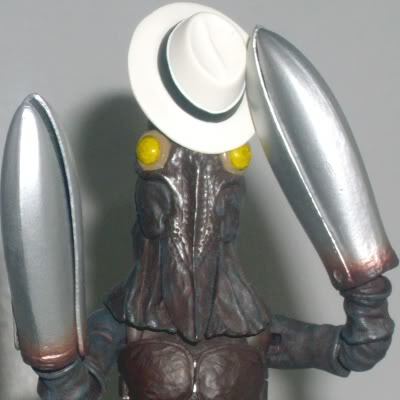 I really like the effect of the dirty brown wash that I used on the body, arms and nails - makes Megalon looks like he just got up off the ground after a dusty rumble with Godzilla and Gigan! And this is the comment I just received from my customer who purchased the first one in the series: "Megalon arrived yesterday and is perfect! The paint is spot on. There are no words to describe how pleased I am with it. Thanks much. 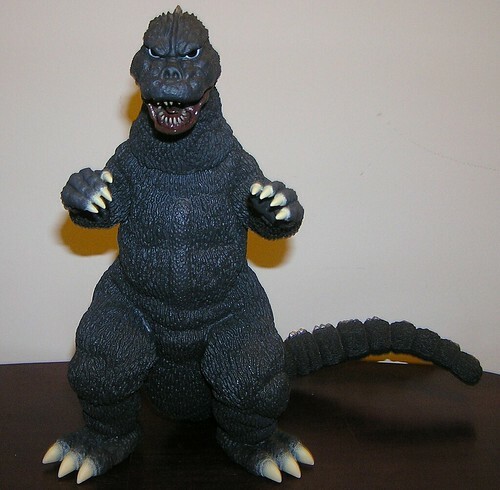 Next year I plan on contacting you about building a Marmit Gorosaurus kit for me." Wow! Those eyes appear to be semi-transluscent to me. Looks awesome! sachiel wrote: Wow! Those eyes appear to be semi-transluscent to me. Looks awesome! They are. If I'm not mistaken, the kit comes with clear "lenses" that go over the sculpted eyes. Actually there is an inner skull with the eyes (that need to be first painted). Then on top of that is the clear outer head that is fitted over the skull and glued and joint-detailed. Then all the clear head is painted black except for the eye lenses. A very nice detail added by Marmit which works great for this sculpt. Ah cool. I knew there was an inner eye & a clear outer cover, but not owning the kit, I didn't realize how it was accomplished. That's actually a more innovative way of accomplishing the end result than I expected. I'd imagine that makes it easier to keep the clear part of the eye free from paint, glue, or the "fog" that can sometimes form on clear pieces of models (like, say, the windshield of a certain Batmobile I might've built as a kid...) from the fumes of the glue. 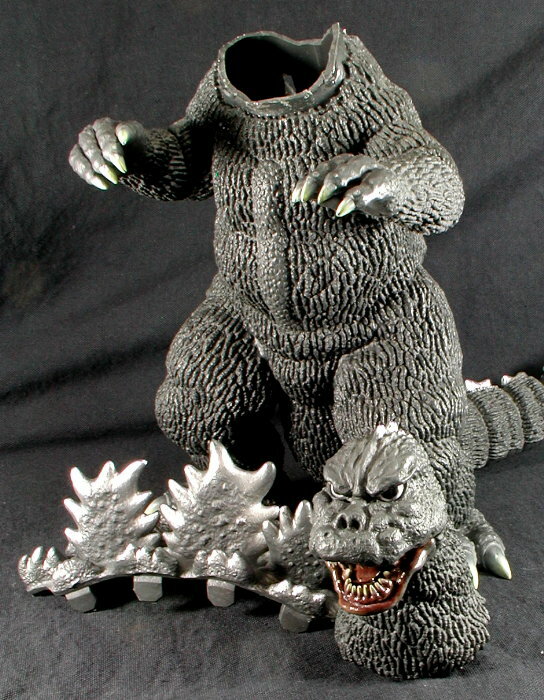 Perhaps a dumb question for Kaijuzoo, but do you work on older kits? 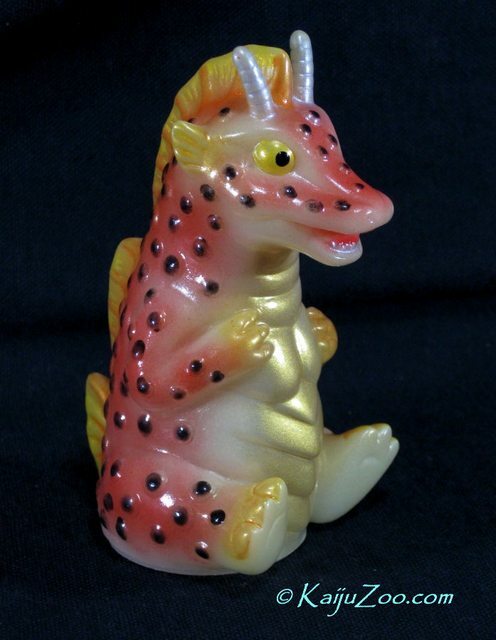 I have a Billikin Gomora kit(still unbuilt) that I'd love to have made up, but I don't have the skill or time to do so myself. I've had the kit for at least 15 years and I feel silly still having it in the box. canofhumdingers wrote: ... or the "fog" that can sometimes form on clear pieces of models from the fumes of the glue. 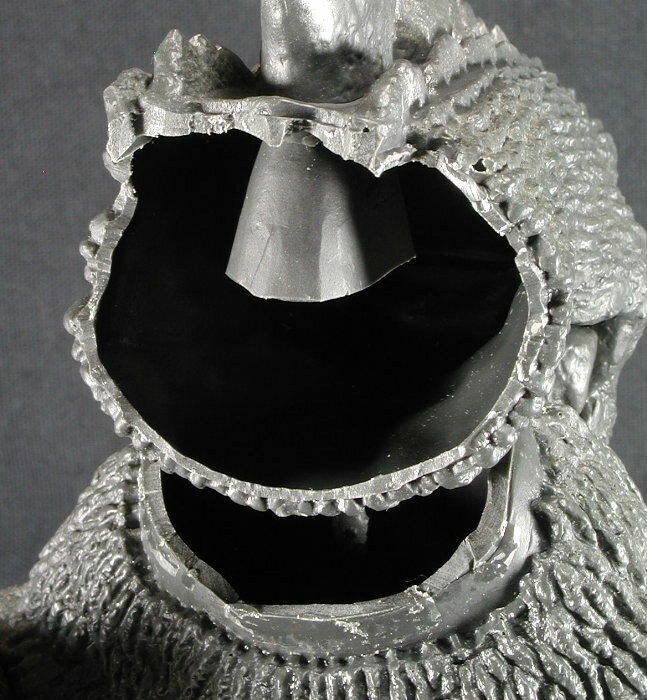 Yeah, there are several reasons to be extra careful when using cyanoacrylate glues (e.g. Krazy Glue; Super Glue). On certain materials, they can set up a chemical reaction which can quickly release noxious fumes, leaving either a white foggy residue or worse, sting your eyes or lungs. For that reason, I always have a small fan or air gun running over the kit during glue-up to dissipate the fumes. And you all know the other problem ... you end up getting your fingertips glued together, so keep the nail polish remover (acetone) handy!! 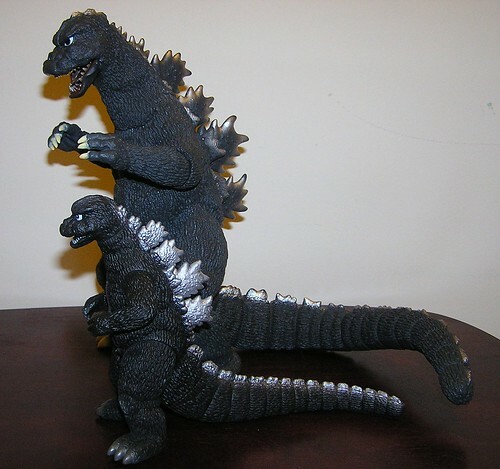 heroforhirerob wrote: Perhaps a dumb question for Kaijuzoo, but do you work on older kits? 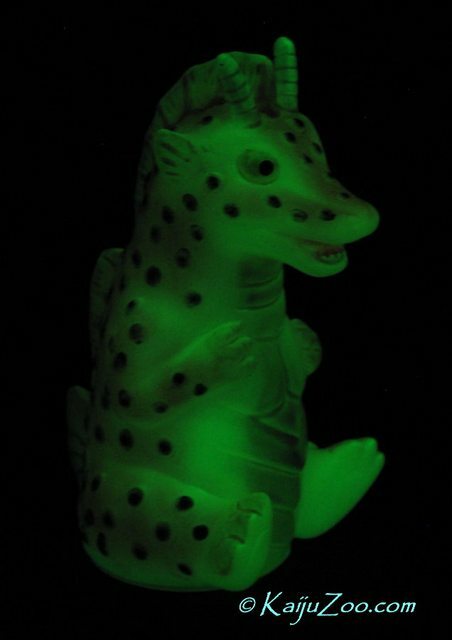 I have a Billikin Gomora kit(still unbuilt) that I'd love to have made up, but I don't have the skill or time to do so myself. I've had the kit for at least 15 years and I feel silly still having it in the box. Oh sure, that would be a custom commission. The most recent old Billiken kit I completed was this way-cool MechaG '75. Please email me though my website, thx! I am trying to get the web pages completed for my more recent custom commissions. Each of the recent 8 or so projects shown in the custom section of the home pagehave at least two pictures now (click on both the link and the thumbnail), but I still need to finish these pages. And please tell me which ones you would like to see more pics of first. However, this Falchion Ebirah commission has the full web page completed, I'd appreciate it if you would please take a look!! ^^^ Thank Klen7, great write-up of our cooperation on this commission! Here are a few more pics of the before and after shots. 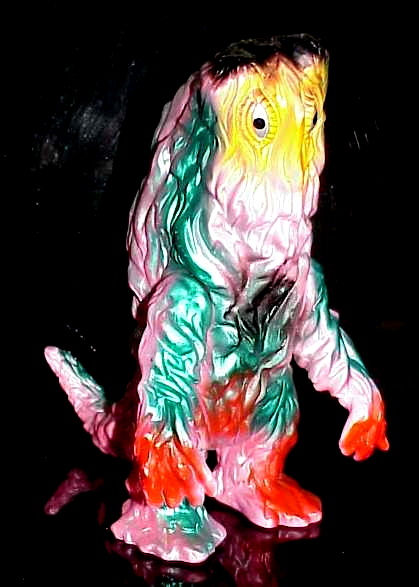 As shown above this was my 135th completed KaijuZoo exclusive or custom commission over the past ten years. And I have a few more recent commissions to add to this thread from additional ClubT customers such as TripMasterMunky and KingGhidorah, many thanks again to all.